Chasewater, the dam, the dead fish. It’s all going a bit mad right now. I was alerted a couple of nights ago by [Swan-pig] that the dead-fish story had been recycled by the Burntwood Post, which I have been trying to track down a scan of, but failed. Since It’s all part of the Post & Fail group, the story (I assume it’s the same one) has appeared on the website of the Sunday Mercury. Thousands of fish dead at Chasewater Pleasure Park – Sunday Mercury. A cormorant. If these buggers ever work out how to make bouncing bombs, we're all doomed. This one put me in a difficult situation, because as I clearly stated in my original post, the photo and further information were from the excellent Chasewater Wildlife Group. When I saw the fish, I actually couldn’t bring myself to photograph them, so used and credited theirs, instead. I sent a mail to CWG to apologise, and it seems the lazy journalist syndrome has struck again; I don’t post a blog on CWG, just link to them. I’m a bit puzzled as to what cormorants have done to merit the ALLCAPS treatment, too. The dead fish story has been updated on their news page. Graham Evans of Chasewater Wildlife Group sent me a lovely mail in return, and I’m very grateful to him for his grace and hard work in pursuit of an area both we, and most of the residents of the area, love deeply. Nice one, chaps. Meanwhile, the shrill, hysterical dam kerfuffle seems to have energised broad swathes of the community, mainly due to the Chicken Little-esque behaviour of an MP who should know better. His scaremongering, and subsequent faux-offence at his parliamentary snub has caused many to believe that the dam at the reservoir is in imminent threat of collapse. This is not the case. The situation has been exacerbated by an eager media, including Central News, who helpfully included a scary map of all that would be swept away in the event of a breach. Here’s some facts on the subject, confirmed by Lichfield District Council on their official Chasewater Dam website (it’s down at the moment, perhaps leaking water flooded their servers}. There is no immediate threat from the dam, it’s safe, but needs work to upgrade it. The structure is to be upgraded in line with recommendations from surveyors from the Environment Agency to prevent the ‘worst case scenario’ of the dam overflowing and being breached. The worst case is highly unlikely, but possible. It’s sensible to address the issue. Work on the Dam to perform this upgrade is due to start in April, preparation in the form of scrub and tree clearance has already begun. Water has been drained from the lake, and will continue to be released for some time in order that the work may take place. All earth dams leak. Part of the work is to include rock screens to be fitted to prevent the leakage eroding the dam. The work is very expensive, and Lichfield Council don’t think they should fund it alone. I think anyone understanding the situation would agree with that. This panic is financially motivated. My condemnation of Michael Fabricant and his unfeasibly large mouth still stand. Those living near the dam will now find it impossible to get insurance, and many locals now believe we’re a hairs breadth from re-enacting the biblical story of Noah. This has not been helpful, and diplomacy would have been far more effective. I note my condemnation as being ‘a politically motivatrd blogger’ in this political news forum (halfway down the page, post by MeldrewJr. Sorry, if you’re a Mac user like me, you’ll have to use Firefox, Safari won’t work) – cheers, mate. I’m motivated by truth, not fear. Should we be reduced to building arks, leave the CORMORANTS out of it. They’re bad news, OK? This entry was posted in Brownhills stuff, Chasewater, Environment, Events, Followups, It makes me mad!, Just plain daft, Local media, Local politics, Shared media, Spotted whilst browsing the web, Wildlife and tagged Brownhills, Chasewater, Chasewater Dam, Chasewater Wildlife Group, chicken little, Cormorant, Dam leak, Dam works, dead fish, Floods, Lichfield Council, local blogs, Local History, Local politics, Michael Fabricant, Politics, Reservoir, Silly, Sunday Mercury, Wildlife. Bookmark the permalink. I have to say I’m rather amused in a cynical way by the hype, it appears by the volume of water that will be released in a swathe of devastation from here to Tamworth that the depth of Chasewater must rival Lake Baikal. Quite a coup for Walsall to offload it onto Lichfield, at the time I remember a feeling of betrayal, since our rates had built the park, but now I’m quite happy, we still get to use the park, but we don’t have to keep paying for it! Thanks for the kind comments and very level-headed, and accurate, summary of the dam and dead fish stories. The Environment Agency’s possible explanation (as explained in the Sunday Mercury’s article) could certainly have credence since many Cormorants and Goosanders were regularly feeding around where we imagine the ‘plug-hole’ to be. Both species are known to hunt collaboratively and can gather together large shoals of fish which then become easy prey, resulting in a feeding frenzy. The sluice had only been slightly open so just how so many fish managed to get into the initial outlet pool, then into the canal before dying has yet to be explained. Stress, low oxygen levels and sudden temperature changes are all possible contributary factors. I spoke to a chap who had seen them alive but gasping at the surface and was upset that nothing had been done to help them before the surface froze over. 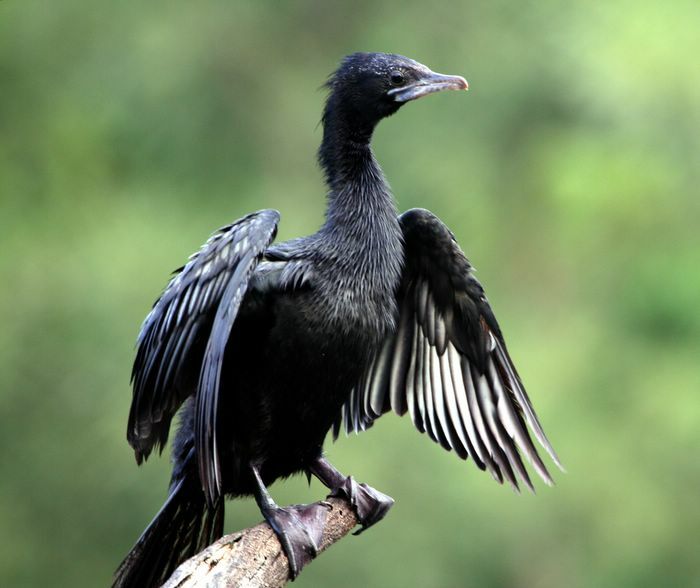 By the way, the cormorant picture you used was of a Little Cormorant, a native of India and South-east Asia and never recorded in Britain; now that would be a good one to find at Chasewater! Apparently the Burntwood Post made a similar mistake by humorously printing a picture of a Shag, a very rare visitor to Chasewater. Not many birders have had a shag at Chasewater but loads of locals reckon they have! We now have photographic evidence that the huge shoals of fish were gasping for air in the outlet pool, at the head of the canal, as long ago as 24th December (see the Chasewater Wildlife Group Diary for that date). Personally I think the whole matter is EXTREMELY FISHY! Sad for the fish and the birds, not to mention the shag-spotters – I hope it will not take too long to sort out.